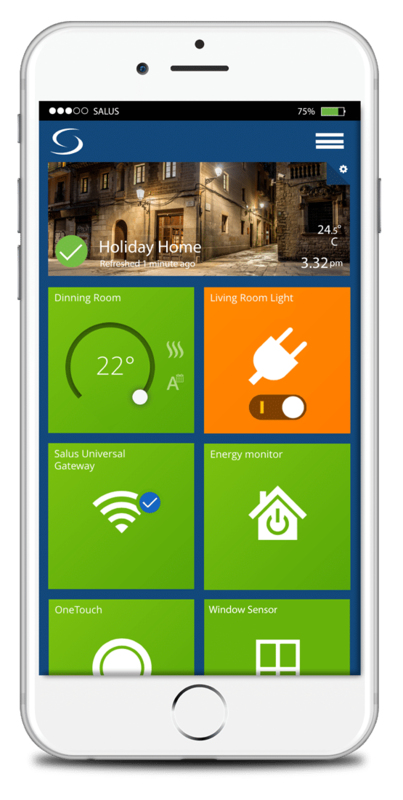 With your Smart Home dashboard, you can effortlessly manage your equipment and connected home from one screen. Here you can pin equipment, run OneTouch rules, and monitor your gateway connection status and equipment states. Your dashboard will display tiles and a first time user welcome message. To close the message, click on the X in the upper right-hand corner. A gateway tile is automatically pinned to your dashboard. Pin other tiles to easily control equipment or run OneTouch rules. Control equipment with the flip of a tile. Check your system connection status with a quick glance on your dashboard. NOTE: If you have created a Smart Home account, but have not yet connected a gateway, you will be prompted to activate one. The Smarthome app automatically includes a photo in the banner at the top of the screen. You can change this if you wish. 1.On the Dashboard, click the gear icon on the upper-right of the banner. 3.You can now either take a new picture or use an existing photo from your library. 2. **First time app users only** Select OK to give the app access your camera. 4.Select Retake or Use Photo. • Select Retake, and the camera returns to picture-taking mode. • Select Cancel If you decide not to take a picture. • Select Use Photo to insert the picture in the banner. 5.It immediately appears in the banner. 1.Select Choose photo from library. 2. **First time app users only** Select OK to give the app access to your camera. 3.Select OK to open your photo library. Once you insert a photo, the Smart Home provided images are no longer available. You can always change to another photo of your own. Tiles that are pinned to your Dashboard can help you easily manage your equipment and system. Arrange them any way you want. Flip them over to view equipment information or to control certain pieces of equipment. How Do I Arrange Tiles? You can move tiles around on the dashboard to customize their location for your needs. 1. Click and hold a tile for a couple of seconds. 2. Wait for the background screen to darken. 3. Drag the tile to desired location. How Do I Flip Tiles? Turn a tile over to view equipment information or to control certain pieces of equipment, such as thermostats and smart plugs. 1.Click on a tile once to flip it over. 2.Click on the “X” in the upper right-hand corner of the tile to flip it back to the front. When you see a grey tile, that means the piece of equipment is Offline. If a gateway is offline, all equipment associated to that gateway will be disconnected. One or more pieces of equipment can be individually disconnected while the gateway remains online/connected. Equipment cannot be controlled via Smart Home while it is in a disconnected state. Only thermostat tiles will increase in size on the page when flipped. Once you successfully connect a piece of equipment or set a OneTouch, it can be pinned to your Dashboard for easy access during the set-up process or anytime afterward. Setup wizards generally include the option of pinning a tile to the Dashboard before completing setup. Gateways are automatically pinned to the Dashboard. 2. Next, choose All Equipment for equipment or OneTouch. 3. Locate the equipment or OneTouch tile to appear on the Dashboard. Equipment: Click the equipment tile. This will open the equipment detail. 1.Tap the pin icon in the right hand corner near the equipment icon. OneTouch: Click the OneTouch tile. This will open the OneTouch details page. 1. Locate the “Add to dashboard” section of the page. 3. Navigate to the Dashboard to see the tile. Repeat the process for all desired tiles. Note: The following products cannot be pinned to your dashboard, TRV10RFM, RX10RF, RE10RF, KL08. Tip! You can also pin equipment from the All Equipment “Categories” screen. 1. Locate the equipment tile you want to remove. 2. Click on the tile to turn it over. 3. Tap the pin icon in the lower right-hand corner of the tile. Your tile has now been removed from the dashboard. 2. Next, choose All Equipment or OneTouch from the dropdown menu. 3. Next, locate the equipment or OneTouch tile you would like to unpin. Equipment: Tap the pin icon in the lower right-hand corner of the tile. OneTouch: Click on the tile you would like to unpin. Check the circle next to “Don’t Pin”.